Download our Investment Deck, read up on our Referral Programme and Market Report. Our vision is of a low-carbon high-wellbeing future where all buildings are sustainable. In service of this, our mission is to provide zero carbon biophilic modular buildings to multiple key markets. 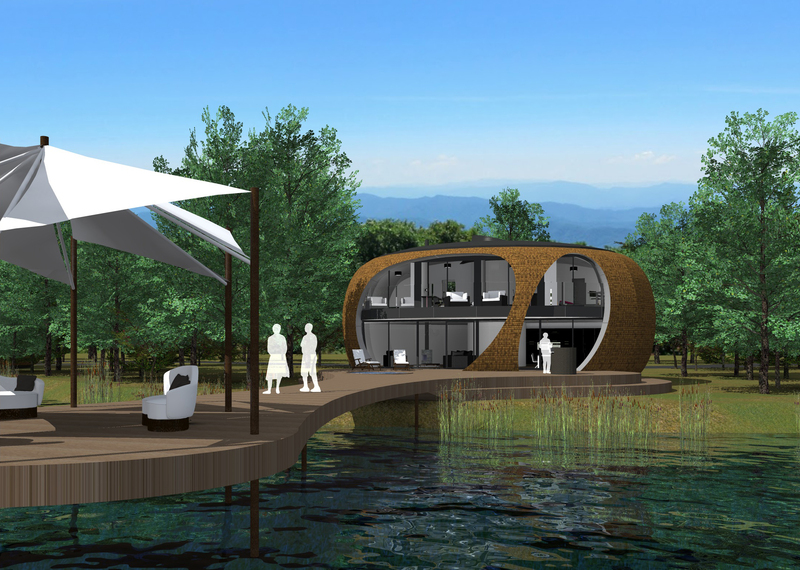 The unique zero carbon PassivPod offers comfort, connection to nature and energy independence with flexibility for living, leisure & learning. The design is uniquely beautiful and utilises state of the art biophilic and passivhaus design techniques. Both these trends are growing in market share and are recognised as key innovations for next-generation buildings. As an original and flexible design for what will become numerous high-value real estate assets, early investment in PassivPod is a high-growth opportunity. Please check out our new PassivPod brochure here. There are four core social and environmental challenges that all iterations of PassivPod help to address. Climate change: 20-30% of global carbon emissions come from constructing and operating buildings. The UK’s Climate Change Act 2008 and the global Paris Agreement 2015 legally require a swift transition to a net zero carbon economy. PassivPod is powered by 100% renewable energy and its construction minimises waste and embodied carbon. Energy costs: Energy costs are rising and 2.4 million UK households (around 10%) are in fuel poverty. For businesses and institutions, reducing utility costs increases profit margins or allows more budget for productive investments. PassivPod is extremely energy and water efficient, and the minimal amount of energy required is generated on-site with renewable technologies. This reduces utility costs to almost zero and makes users independent from grid failures. Unhealthy buildings: Europeans spend 90% of their time indoors, so having a built environment that promotes health and wellbeing is crucial. But indoor air quality is often worse than at street level, causing numerous health problems. Research shows that buildings rich in daylight, fresh air and nature enhance health and wellbeing. Biophilic design principles are at the heart of PassivPod, with its natural materials, organic shape, extensive glazing and ventilation system. Inefficient construction: Traditional construction takes a relatively long time, often a year or more, and generates a lot of waste. By using prefabricated manufacturing, modules can be manufactured in factory conditions with minimised waste and energy use. They can then be transported to site and assembled in a matter of weeks. Our Built to Learn report explains how using green design can be used to boost student engagement, achievement and wellbeing. PassivPod is a zero carbon modular passivhaus combining comfort with sustainability. It addresses diverse social and environmental needs with flexible sizes: a home to reduce utility costs; ecolodge to bring tourism to deprived rural areas; office to improve productivity; classroom which enhances cognition and improves sustainability education. PassivPods will be factory prefabricated and transported to site in modules for quick assembly with our design-and-build service. The innovative pod-shaped design uses passivhaus and biophilic principles. It is 100% renewable-powered, highly energy efficient, generating solar power on-site with a wood-burner for ambiance. A sustainable timber structure minimises embodied emissions. The original design for PassivPod was a commended finalist in the Sunday Times Eco-Haus Competition 2014. See Design and Technical Information for a fuller explanation of the product. Initial designs and 3D models for leisure, and domestic versions of PassivPod and the floorpans for the educational classroom and garden office versions have been completed. Trademarks and all visible designs are registered, which also allows for international licensing of designs. NDAs in place with partners, staff and agents. Our next steps are to do full costing and start raising capital to build full-sized prototypes. We are seeking expressions of interest from landowners interested in a subsidised prototype, and have already had interest from schools and lodge park owners. We aim to build a prototype in 2019 and be ready to start trading in late 2019. We know of no other suppliers offering multi-purpose modular off-grid zero carbon elliptical two storey buildings. PassivPod is unique with registered IP. The UK’s rural ecolodge rental market has grown substantially in the last few years with 2-3 bedroom properties costing £1000-£2000 per week depending on the season. With 70% occupancy this averages £1500 per week, for 36 weeks this generates £54,000 per year revenue for one lodge. Leisure park ecolodges abroad cost £1m-£3m. 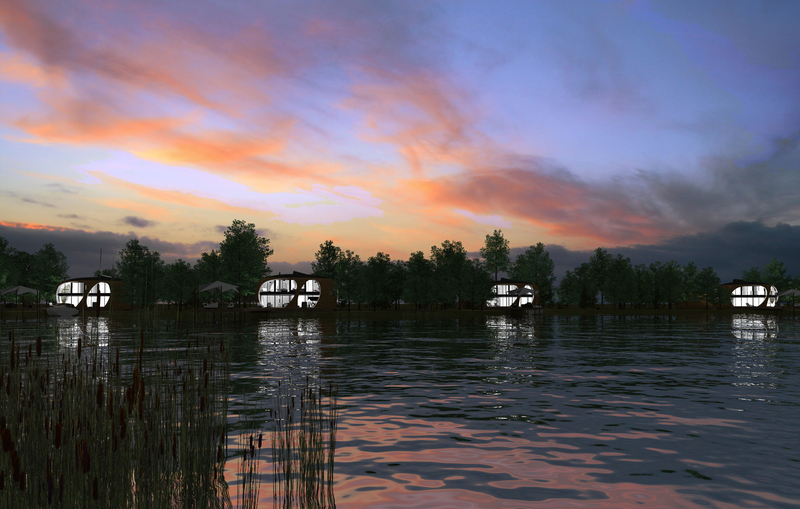 Three bedroom PassivPod ecolodges will be priced at £380,000 and four bedroom lodges at £500,000. Classrooms sale price is estimated at around £115,000 and garden office sale price is estimated £33,000. Unlike most modular prefab offerings, PassivPod’s shape mimics natural forms. A spiral shaped central stairwell leads to an upper floor with a sensor-operated skylight and balcony. Passivhaus standards require almost no energy for heating or cooling. The building fabric uses natural materials, such as sheep’s wool insulation and natural paints for superior internal air quality, avoiding toxic chemical off-gassing. Our revenue model is to sell a design-and-build service to clients, where we provide the PassivPod modules and manage the fabrication on-site by a contractor. Clients will pay us a 10% deposit on sign-off, and the full payment on completion. We have the option to also sell licenses to developers with them managing manufacture and on-site fabrication, which will create cost-effective highly scaleable growth for international sales. 2019 will be spent finalising the technical designs, raising investment and building a full-sized prototype. We expect to start trading in late 2019. In the first 12 months of trading we expect to sell off-plan four PassivPods: one each for a classroom, an eco-lodge, an office and a private home. In year two with one pilot build complete in each key sector we expect increased sales to a minimum 14 units. In year three we expect to sell 30 units, rising to 140 units by year five. This aggregates a total gross revenue of £40M and total net profit of £9M for UK only. International sales are expected 5-10 times higher. Our marketing strategy is focused on digital marketing, networking and earned media coverage, with a minimal role for traditional advertising. A planned crowdfund campaign will attract international awareness from public and private investors. The venture will be led by design and technical director Mark Pellant and commercial director Clive Bonny, who both have entrepreneurial experience and strong professional credentials. Additionally PassivPod Ltd will benefit from design and marketing support from the Koru Architects office team. The support team has award-winning skills in entrepreneurship, technology and innovation, with proven architectural and planning experience in eco-design for commercial and domestic construction. Mark Pellant is an experienced architect specialising in contemporary sustainable design. Mark set up Koru Architects in 2000 and the practice has since won several awards, including being commended for the RIBA Sustainable School Ideas Competition 2000, winning the RIBA Download Prize for Sustainability 2011, being commended for the Eco-Haus Design Competition 2014 and most recently winning gold in the international Green Apple Award for the Built Environment 2016. Before setting up his own successful practice, Mark worked for several internationally acclaimed practices including Conran & Partners and Sheppard Robson. Mark serves on the Architects Design Review Panel for Eastbourne Borough Council and has been a fully chartered and registered architect for more than 25 years. Clive Bonny is a professionally qualified management consultant, having set up his own consultancy Strategic Management Partners in 1990. Clive is an expert in business strategy, risk management, business environmental policy, fundraising and intellectual property protection. His consultancy has achieved Gold Award for national Responsible Business Standards 2012-2015, won the 2016 Corporate Vision Technology Innovation Award, and the 2016 Emerging Technology Excellence Award from Corporate Live-Wire. Clive has managed business support projects in the construction, leisure, government, education and environmental sectors, including Brighton University Green Growth Platform, South East Construction Consortium, Organic Roofs, Cliff House Park, Osea Leisure Park and others. See our Meet The Team page to learn about the other four team members. “Roedean School has exceeded DFE standards as the highest performing girls school in Sussex, Kent and Hampshire for grades AAB in two facilitating subjects. We are equally known for our excellence in delivering a rounded education. 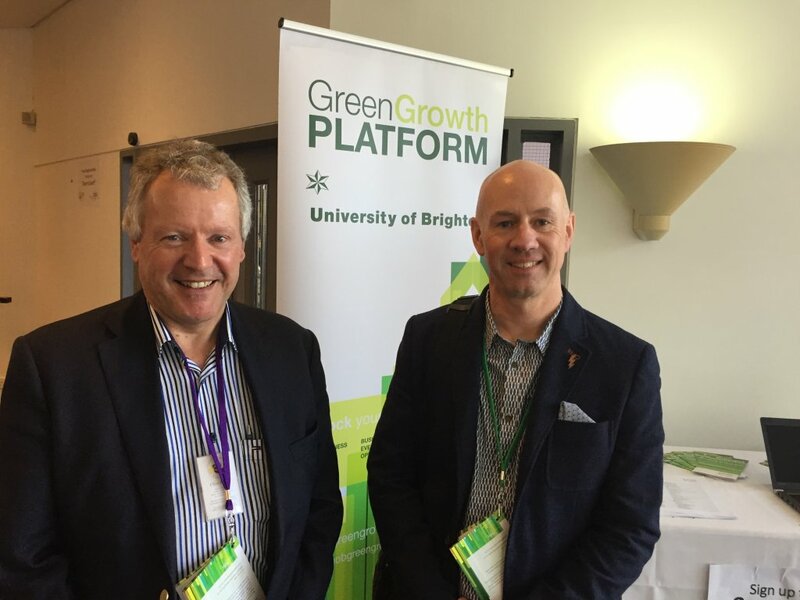 “The University of Brighton Green Growth Platform is a UK leader in supporting the sustainability of over 700 low carbon businesses in the last 3 years, including PassivPod. “PassivPod has significant international growth potential as a unique elliptical multi-purpose zero-carbon biophilic building. “When Mark showed me the conceptual images of the PassivPod, ideas of how to engineer and build it quickly came to mind. We can quickly test and refine these ideas due to our engineering experience and close working relationship with timber fabricators. We are confident that by adopting our design processes, we can provide an efficient engineered structural solution for the PassivPods. Please view other endorsements here. If you have any questions regarding PassivPod, please read our Q&A document here. Currently the two directors, Mark Pellant and Clive Bonny, own 100% of the equity. They are liaising with major crowdfund platform providers for a further £350K equity share for initial classroom and garden office buildings, and international marketing. Download our Investment Deck, read up on our Referral Programme and Market Report. You can view more information about our investment offer here and read our HMRC letter here. If you would like to hear about PassivPod’s development and progress, please sign up to our email list to be kept updated.